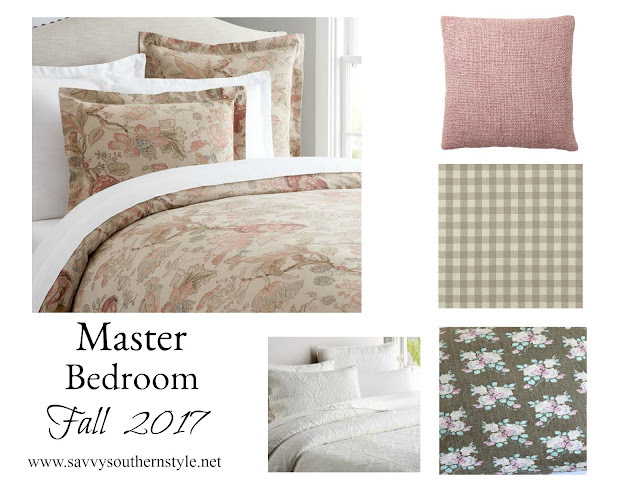 I love to change the bedding in the bedrooms seasonally and it's time to put away the white bedding in the master and bring out some soft colors. I put this mood board together to give you a little fall preview of the colors and patterns I'm using this fall in the master. I'll be sharing the new look soon. I'm praying for everyone in hurricane Irma's path and it looks like Atlanta is in that path too with heavy rain and strong winds possible starting on Monday. Pretty Kim! Stay safe. We have the same Irma problem. My sisters from Fl are all up here now waiting it out. This chick, Irma is a Bad Girl...Go Blow Away !! I love the colors! Fall is my favorite time of year. I pray for everyone'so safety. Beautiful Kim. Eager to see the final look of your bedroom. Sending prayers for everyone in the south. Oh it's going to be beautiful..saw that duvet at PB and yes, so much prettier in person!! Looking forward to seeing the reveal! Kim, I love the color palette! I know you are anxious to get your master suite put back together! Kim, I bought the same duvet cover at PB; it is so beautiful! I'm looking forward to see what you do with the floral fabric! Barbara, that is actually a pillow cover from Pottery Barn and they appear to be out of them. It was deeply discounted and I love it with that duvet pattern.